Part serious cruiser, part mini-superyacht, the luxurious Moody DS54 combines the romance of passagemaking with the comfort and amenities of a powerboat. 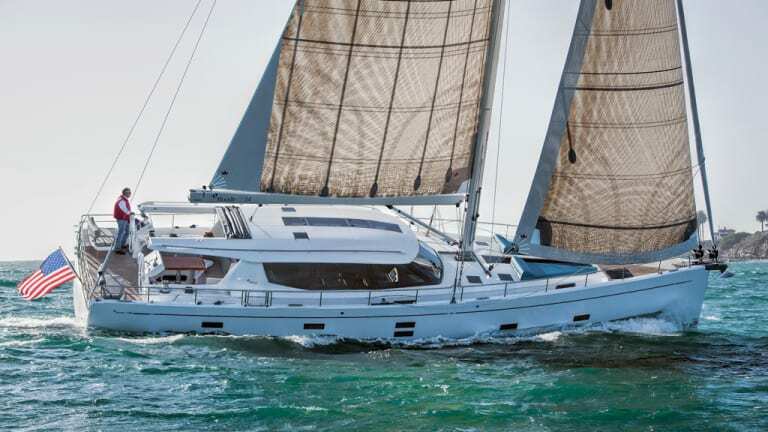 This may be the perfect crossover yacht for the sailor contemplating switching to power, but who just can’t bring himself to do it—because now he doesn’t have to. 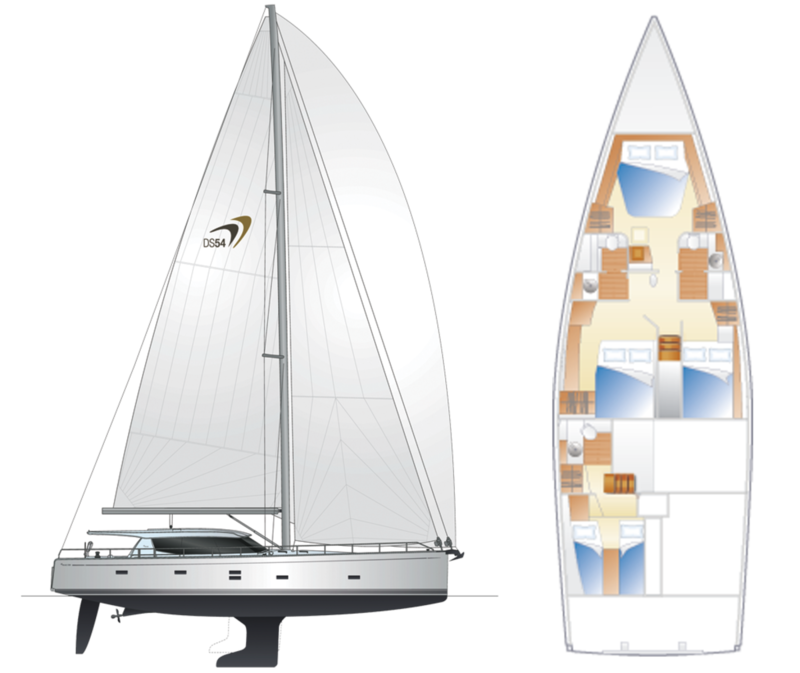 The overall design of the DS54 is attributed to Bill Dixon, which is where the deck saloon and superyacht touches come from. However, Moody is owned by Hanse, and the hull for the DS54 is based on the Hanse 575 hull drawn by Judel/Vrolijk. That said, the Moody looks completely different, with a high coachroof and a two-story layout. Because the design gained 10,000lb as part of its metamorphosis, the Volvo engine was upgraded from 110hp to 150hp. Below the waterline, the Moody has a single rudder and offers two keel configurations—a shoal-draft keel drawing 7ft 4in and a standard, deep L-shaped keel, which draws 8ft 5in. Hull construction consists of a vacuum-infused balsa core sandwich with an integrated carbon-reinforced GRP grid for additional stiffness. A watertight bulkhead is forward. Moody also borrowed Hanse’s sailplan, a tapered keel-stepped Seldén aluminum mast with double aft-swept spreaders that support a sail area of 1,729ft2. The standard in-mast furling main has full vertical battens. The self-tacking jib on a track ahead of the mast makes singlehanding a breeze. Standing on the dock next to the towering Moody DS54 can be intimidating. The hull sides are high, and the deckhouse above adds further gravitas. However, an easy way to board is via the hydraulic transom that lowers to form the swim platform. With the transom down, you can also see into the garage, which can hold a half-inflated dinghy or any number of different fenders and toys. This is not a watertight compartment, so items inside may get wet. A ladder to port leads up to the main deck behind the twin composite console helms that resemble pods on a superyacht. At each station, our test boat had a white Carbonautica composite wheel, a Raymarine Glass Bridge 95 MFD, full instrumentation, engine throttles, autopilot control and toggles for the twin electric Furlex headsail roller furlers. Due to the high coachroof, visibility forward involves looking over, around and through the deck saloon. If you step out to the side deck next to the wheel, you cannot see the bow, although a mast-mounted forward-looking camera will help. Backing into the slip provides better sightlines, and the Quick retractable bow and stern thrusters make docking this big boat manageable. High bulwarks and a solid railing from bow to stern are reminiscent of a powerboat and add a feeling of security when moving about on deck. A second rail is recessed into the cabintop, so in rough conditions you can go forward while holding on with both hands. Eight retractable cleats on the cap rail will keep sheets from snagging. The railing is mounted slightly inward, both to allow a fair lead for the shrouds and to provide room for a genoa track on the caprail. This track is a bit short, but the large genoa will mostly be used when sailing off the wind, so its 3ft of length should be sufficient. The deep cockpit is two steps down from the main deck and is covered by a composite top that extends from the cabinhouse back to the steering pods. There is also a retractable fabric sunroof in the middle. A large U-shaped settee to port wraps around an adjustable cockpit table, and there is an optional drawer refrigerator below the straight settee to starboard. The cockpit is wide, like on a catamaran, and provides excellent protection against wind, sun and rain in a way that will inevitably appeal to many sailors who are done with being beaten by the elements. Entry to the interior is via a large sliding-glass door, much like one you would see on a powerboat. A window to the side opens to the cockpit as well. Our test boat had the “galley-up” layout, with a U-shaped kitchen aft to starboard. Corian countertops, twin sinks, an Eno three-burner gas stove/oven and a small Fisher and Paykel dishwasher represented a mix of the standard and optional equipment available. Ahead of the galley and to starboard is a forward-facing nav desk, with an MFD, engine throttles and Raymarine autopilot. The latter allows you to steer from inside, so that watchstanders don’t have to leave the comfort of the interior on long passages other than when docking or trimming sails. In the “galley-down” layout, the nav desk moves aft to port, and the galley moves forward and down, usurping one of the guest cabins below. 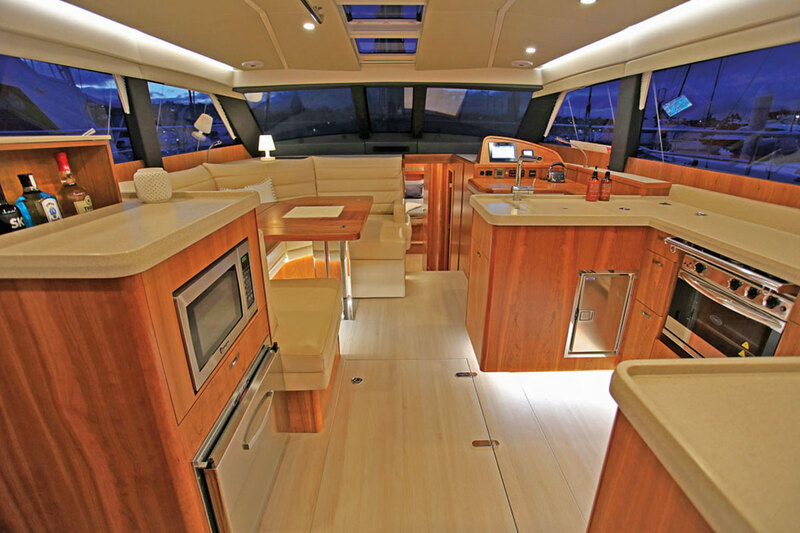 When Moody added the deck saloon, it created enough interior height to effectively build two stories—sort of. Five steps lead down to the three forward cabins, which include a master stateroom in the bow that is flooded with light from an overhead opening hatch, a fixed skylight and the ports in the hull. Two guest cabins—a larger double to port and a smaller one to starboard—share a head, while the master suite has a dedicated bath with a separate shower stall. In the foyer between the three cabins is a C-Zone digital controller and bus that monitors pretty much all the onboard systems on one screen. A 12-volt panel also provides an override for critical systems, like the Lopo nav lights and chartplotters, in case the digital bus ever becomes inoperative—a kind of built-in redundancy that is a very nice touch. A fourth double cabin is aft; to port an optional Miele washer/dryer combo can be added to a compartment in the head. Our test boat had the optional cherrywood finish. (Mahogany is standard.) Here, the DS54 sheds any resemblance to most other production boats with satin hand-rubbed real wood that looks richer and more solid than the engineered wood surfaces typically found these days. Soft lighting and tunes from the boat’s Fusion stereo will make for a posh offshore experience indeed! Our test day in San Diego presented the kind of conditions that I thought would be challenging for this heavy boat, with the water flat, and the wind fluky, only blowing 8-13 knots. That said, with just two of us aboard, I figured I’d at least get a sense of how easy this boat is to sail shorthanded—which is, after all, how Moody is positioning it. Imagine my surprise, then, as we scooted along at a zippy 7.4 knots in 10 knots of breeze at a 70 degree apparent wind angle (AWA). The speed then bumped up to 9.4 knots at a 60 degree AWA when we stumbled upon a 13-knot gust, and even on a broad reach in 8 knots of true wind, we managed to eke out a satisfying 5.1 knots. Although I would love to sail this boat again in snotty seas when it’s blowing 30—conditions in which it should truly excel—there’s no denying she also does an impressive job in the light stuff. Our boat was suited up with Elvstrom HPM (high-performance membrane) laminate sails that were managed by a pair of electric Lewmar winches. Coupled with the aforementioned electric above-deck headsail furlers, they create a situation in which hoisting sail requires little more than exercising your index finger. Auxiliary power is provided by a Volvo-Penta D3 diesel with a straight shaft. The standard Jefa steering makes for very light and responsive helming. On flat water, we motored at 9.3 knots with the throttle set at 1,980 rpm. At wide-open-throttle, the Flexofold prop pushed us along at 10.4 knots with the engine turning over at 2,820 rpm. Despite its large sail area and a displacement of over 53,000lb, the Moody DS54 is remarkably easy to sail with just two. These Moodys have also competed in the Sydney to Hobart race, so if you’re looking for a gentleman’s yacht that not only provides plenty of protection from the elements but can really sail, put this one on your list.